Meet your guide at the pier. Today, the core of Dutch Jewish life is in the south of Amsterdam and the adjacent suburb Amstelveen. Kosher shops and restaurants, Jewish schools, synagogues, youth movements and a Jewish home for elderly. All those are focused in that area. Nevertheless, until the Second World War, Jewish Amsterdam was centered around the Sephardic – and Ashkenazi synagogues. 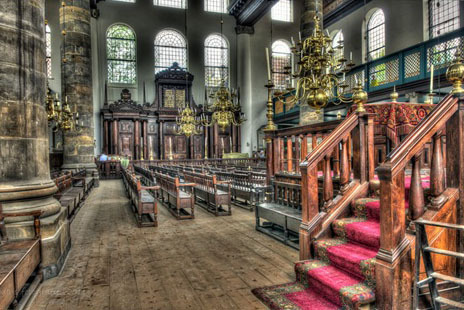 This Jewish history walking tour guides you through this old Jewish quarter of Amsterdam. The Portuguese Synagogue, or ‘Snoge’, has maintained its authentic seventeenth century state. It is still in use. The PIG (Portugees Israëlitische Gemeente, Portuguese Israelite Community) holds religious services there all year round. In January 2012 Israeli Prime-Minister Benjamin Netanyahu described it as one of the most beautiful synagogues he had ever seen. In its compound is the Etz Chaim Library. It consists of 560 manuscripts and 30.000 printed volumes. Those are the proof that Amsterdam was the center of the free uncensored press in the 17th century, of which the entire Jewish world took advantage. 1987, the Amsterdam Jewish Historical Museum has been inside of four former Ashkenazi synagogues. Jewish culture and religion in Amsterdam are treated in the first section. Religious objects used by Amsterdam’s Jewish community are exhibited. Jewish travelers from all over the world can also learn here about the customs of Amsterdam Jewry. Marvelous paintings by Max Lieberman, Jozef Israëls and others illustrate those themes. The second part of the exhibition is inside of the former Ashkenazi synagogue’s women’s gallery. It treats of the history of Amsterdam’s Jewry. Special attention is paid to Baruch Spinoza or Bento de Espinosa, one of the world’s greatest philosophers. He was a member of the 17th century Amsterdam Jewish Community until 1656. In that year he was excommunicated because of his controversial ideas. Close to the museum his statue stands right on the spot where his house was. Walking over to the exposition’s third part, we see examples of 19th- and 20th century Jewish businesses in Amsterdam. Those were founded right after Louis Napoleon granted the Jews the Dutch citizenship and equal rights. The Bijenkorf and HEMA for instance, have been very successful companies until today. Another place to visit on your Jewish Amsterdam sightseeing tour is the Holocaust Memorial inside of the ‘Hollandse Schouwburg’ (Dutch Theatre). During the Second World War, the Nazis used this as the deportation center. The held the Jews captives are before deporting them to the concentration camps. Memorial functions are held here on Holocaust Day (Yom Hashoa) and May 4th (the Dutch National Holocaust Memorial Day). On the Remembrance Wall the family names of the 104.000 Dutch Jewish WWII victims appear. The eternal flame symbolizes the eternity of their souls. After lunch, boat canal cruise and Anne Frank Museum. Anne Frank, a Jewish teenage girl, who hid from Nazi persecution with her family and four other people in hidden rooms at the rear of the building. As well as the preservation of the hiding place — known in Dutch as the Achterhuis — and an exhibition on the life and times of Anne Frank, the museum acts as an exhibition space to highlight all forms of persecution and discrimination.